Texas has two electorates. One votes in presidential election years, and the other votes in gubernatorial election years. They are not the same. The turnouts are different, and so are the results. Turnouts drop when governors are the most-talked-about races on the ballot. And the state’s Republican voters are more dominant in those years. In the last two presidential elections, the average Republican on the statewide ballot — the races for president and statewide offices — got 54.4 percent. In the last two gubernatorial election years — 2010 and 2014 — the average Republican running statewide got 59.9 percent. The averages for Democrats in those elections are the flip: They do better in presidential years, getting 42.6 percent, and worse in gubernatorial years: 36.7 percent. It doesn’t matter much at the top, or hasn’t for the last 20 years: Democrats last won a statewide race in Texas in 1994. But it matters downballot, especially in the handful of districts that are winnable by candidates of either party. The craziest example is the 23rd Congressional District, which changes hands every time the voters are brought in — largely because the electoral swings in the big races bleed into the results across the rest of the ballot. The district, which stretches from San Antonio to El Paso, went Republican in average statewide races in 2014 by a margin of 13.4 percentage points. It was a bad year for Democrats. As with the other numbers, that’s only counting races that included candidates from both major parties, which weeds out the lopsided contests like those with only Republican and Libertarian candidates. In 2012, the average statewide Republican had only a 2.9 percentage point advantage — a bad year for many Republicans. And it wasn’t an unusual pattern: two years earlier, a gubernatorial year, it was 14.2 percentage points. In 2008, Democrats had a 5 percentage point advantage in that district. It showed in the results. Last year, Will Hurd, R-San Antonio, won. In 2012, it was Pete Gallego, D-Alpine. In 2010, Francisco “Quico” Canseco, R-San Antonio. In 2008, Ciro Rodriquez, D-San Antonio. It’s one of the oddest places in American politics, where incumbency is virtually meaningless. When the winds at the top of the ballot are blowing like that, it’s hard on less prominent candidates, who rely on the turnouts generated by the big contests that get most of the public attention. Straight-ticket voting — where voters pull the lever for one party’s candidates instead of individually picking races— make it even more important. 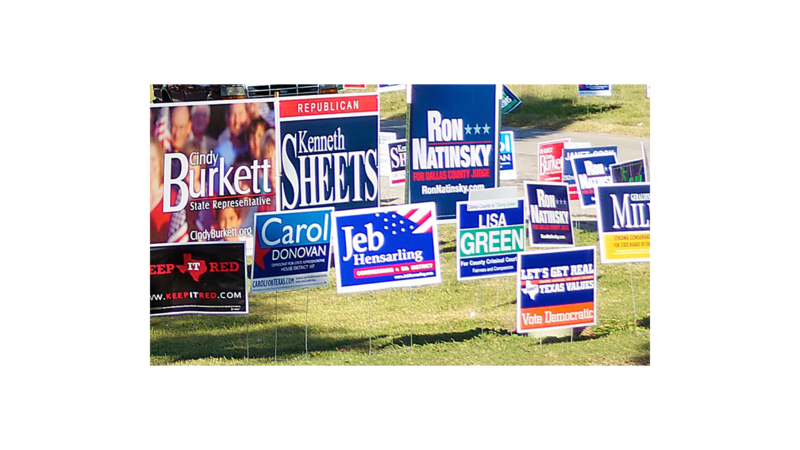 In each of the last two presidential elections, November turnout in Texas has topped 8 million. In the last two gubernatorial years — 2010 and 2014 — it was 4.98 million and 4.73 million. Those bigger electorates are still Republican, but they are less Republican than the small ones. And the numbers filter into the district races. In CD-23, for instance, 80,269 more people voted in 2012, a presidential election year, than in last year’s election where the Greg Abbott/Wendy Davis race was the biggest thing on the marquee. That was a 40.5 percent drop in turnout, accompanied by a partisan swing of more than 10 percentage points toward the Republicans in the lower turnout contest. And it’s just one example. The biggest turnout drop in any of the state’s 36 congressional districts was in CD-16, where U.S. Rep. Beto O’Rourke, D-El Paso, is the incumbent. The turnout there dropped 53.3 percent from 2012 to 2014, to 73,641 votes from 157,723. Luckily for O’Rourke, that’s a safely Democratic district. But the electorate isn’t the same, even there: The average Democrat running statewide in the last two presidential years got 63.5 percent in his district, while the average in the 2010 and 2014 gubernatorial years was 56.1 percent. Some Democrats, even in that party’s strongholds, only vote in the big federal elections. The regular caveats apply: Past results don’t predict future returns, either in turnout or partisan complexion. But by the numbers, the year ahead will be a weaker (but still strong) year for the Republicans in Texas and a stronger (but still daunting) one for the Democrats. And the turnout in the general election will probably be, as one presidential candidate might put it, HUUUGE.